Winrock International is pleased to announce the publication of Pay-For-Performance Conservation: A How-To Guide, a free comprehensive guide to implementing and managing Pay-For-Performance (PFP) conservation programs. The guide is based on Winrock’s decade of experience pioneering PFP conservation, including the Milwaukee River Pay-For-Performance Project, which reduced phosphorus losses by as much as 40 percent from farms in the West Branch of the Milwaukee River Watershed. The health and vitality of freshwater resources depends on cost-effective innovation like PFP conservation. PFP conservation is an innovative approach to improve water quality by financially rewarding farmers for reducing agricultural runoff, which damages water quality. Winrock has spearheaded PFP programs to reduce the amount of phosphorus that washes into rivers and lakes. Phosphorus in fertilizer and manure helps crops grow, but runoff from fields creates dead zones and algal blooms, damaging water quality for people and wildlife. Winrock, in partnership with Delta Institute and Sand County Foundation, managed the Milwaukee River Pay-For-Performance Project, funded by the Great Lakes Protection Fund. By changing their field management practices, farmers along the West Branch of the Milwaukee River reduced phosphorus losses by as much as 40 percent. 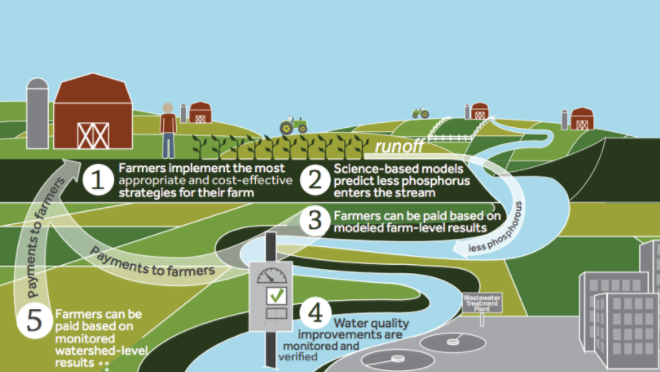 PFP allows farmers to decide the best ways to reduce agricultural runoff at the lowest cost. Farmers earn the largest incentive payments by implementing the most effective actions to reduce phosphorus loss. Simulation models calibrated for use in the watershed are used to estimate phosphorus loss reductions resulting from field management changes. Farmers are paid based on the amount of phosphorus loss they can reduce. Farmers participating in the Milwaukee River Pay-For-Performance Project earned $25 per pound of phosphorous reduction. For example, one farmer reduced phosphorus loss by 183.1 pounds and earned $4,577.50. Farmers are allowed the flexibility to implement any field management change that reduces phosphorus loss. Some land management practices that reduced phosphorus runoff include: reduced tillage, cover crops, filter strips, contour farming, reduced fertilizer rate, winter to summer manure spreading and crop rotation changes.